Molecular gymnastics in 2+2 cycloadditions. There are many treasures in Woodward and Hoffmann’s (WH) classic monograph. One such is acetolysis of the endo chloride (green), which is much much faster than that of the exo isomer (red). The explanation given in their article (p 805) confines itself to succinctly stating that only loss of the endo halogen can be concerted with a required disrotatory ring opening of the cyclopropane. Demonstrating the truth of this statement by computational modelling turns out to be an interesting challenge. I should start by saying that back in 1970, modelling this process quantitatively using extended Hückel Theory (used by Hoffmann to quantify the orbital behaviours) was not an option. It involves the formation of an ion pair from an initial covalent reactant, and then studying the dynamics of whether or not this formation is concerted with the pericyclic ring opening. These two mechanisms may or may not be conflatable (SN1 + electrocyclic). A lot is going on, and it is only very recently that quantum mechanical procedures for combining two such different electronic processes on an equal footing have become available. I did this by using a ωB97XD/6-311G(d,p) method combined with two explicit solvent molecules for the ion-pair, augmented with a continuum solvent field (in this case ethanoic acid). The characteristics of the reaction coordinate (IRC) for the endo isomer are shown below, followed by an animation of the geometries. Firstly, the barrier. The reported rate constant corresponds to ΔG†398 34.4 kcal/mol. The calculated value (from cyclopropyl reactant) is ~27.3 kcal/mol. The IRC shows the ring opening and the departure of the chloride are a synchronous concerted process, involving no intermediates. This indeed is a portmanteau mechanism, as clearly described by WH. Notice how the unconstrained cis-hydrogens at the cyclopropyl ring junction can splay out (starting at IRC ~0.0), enabling the resulting cationic centre (the anion is of course the chloride) to adopt a planar configuration with strong π-conjugation enabled. At about IRC = -7, the potential (and its first derivative in the form of the gradient norm) flattens out. This reminds of what happened with the SN1 solvolysis of t-butyl chloride. However it does not quite go to zero. There is still the dynamic momentum for one more feature. After the allyl “cation” has sorted itself out, the chloride anion returns to the fray, recombining (IRC ~-18) with the cation to replace the ion-pair with a covalent bond. This too is what happened with t-butyl chloride. What about the exo isomer (red above)? The absence of detectable reaction implies the experimental free energy barrier must be ≥ 40 kcal/mol. Cleavage of the C-Cl bond is effectively orthogonal with the electrocyclic opening of the C-C cyclopropyl ring, which forces the two mechanisms to occur separately. The first process is an SN1 ionisation of the halide to form the trans ion-pair below, which has a free energy of 34.9 kcal/mol relative to the reactant, which is then followed by electrocyclic ring opening as a separate step. This would make a lower bound to its calculated reaction rate at least 10 million times slower than the endo isomer. You can see from the coordinates below that the allyl cation cannot become co-planar, which explains its high energy (formation of trans cycloalkenes is known to occur by such a reaction). 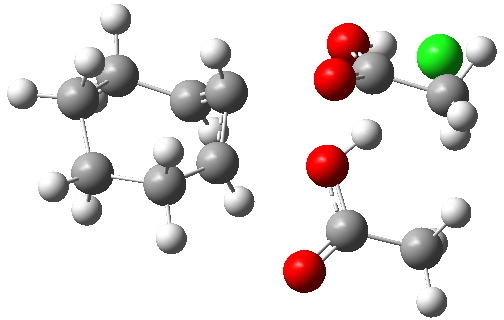 Ion-pair formed from exo cyclopropyl halide. Click for 3D. So we have here two quite different reactions. The first is an example of a mechanistic morpheme, a solvolytically assisted pericyclic reaction. It combines two different mechanisms from different areas of organic chemistry (areas which are most often taught as separate lecture courses, and where the holistic connection between the two is rarely made). The second keeps the two reactions quite separate and sequential. All because of an apparently innocent difference in their stereo chemistries. This entry was posted on Tuesday, December 13th, 2011 at 2:10 pm and is filed under Interesting chemistry. You can follow any responses to this entry through the RSS 2.0 feed. You can leave a response, or trackback from your own site. What a valuable addition to my Advanced Organic Chemistry class! Thank you very much for posting it! Mechanistic morphemes. Perisolvolysis of a cyclopropyl chloride. is licensed by Henry Rzepa under a Creative Commons Attribution-Noncommercial-Share Alike 3.0 United States License.